Red maple trees (Acer bubrum) grow predominantly in the Northeastern United States. 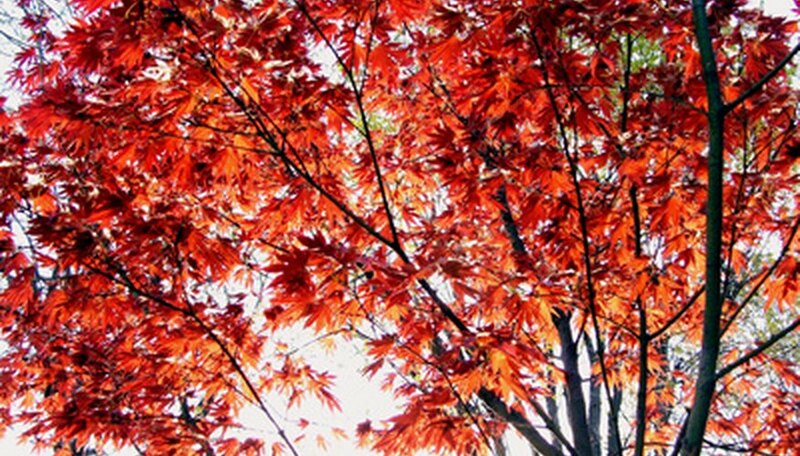 Landscapers and homeowners use red maple as the tree of choice for shady areas. According to the USDA Forest Service, this tree is susceptible to trunk rot and fungus disease problems. Trees are particularly prone to irreparable damage if bruised or injured with landscaping equipment and tools or improperly pruned. According to the USDA Forest Service, inonotus glomeratus disease is the most significant for the red maple tree for causing damage. The fungal disease attacks cut branch locations. A large black knot appears near the cut branch site or on the end of the branch. Inonotus glomeratus affects the branch and nearby sections. Upper portions of red maple trees are affected more by inonotus glomeratus disease than lower branches. Oxyporus populinus disease affects both red maple trees and birch trees. According to the USDA Forest Service, oxyporus populinus disease is the second most significant disease for red maple trees. The primary cause of oxyporus populinus is tree wounds. A large white mass will form that is spongy in texture. Moss often covers the diseased section. Opposite of the inonotus glomeratus disease, oxyporus populinus typically appears on lower portions of the red maple. Careful use of landscaping and lawn equipment near trees reduces the chances of accidental wounds and oxyporus populinus disease. Phellinus igniarius is another fungal disease that assaults trees. According to the USDA Forest Service, this disease is the third most prevalent disease found on red maple trees. The black fungus contains mycelia, which attack deep into the trees. Red maple trees suffer damage at the heart from phellinus igniarius disease. Often, trees with the disease will die due to the extensive harm this fungus does.